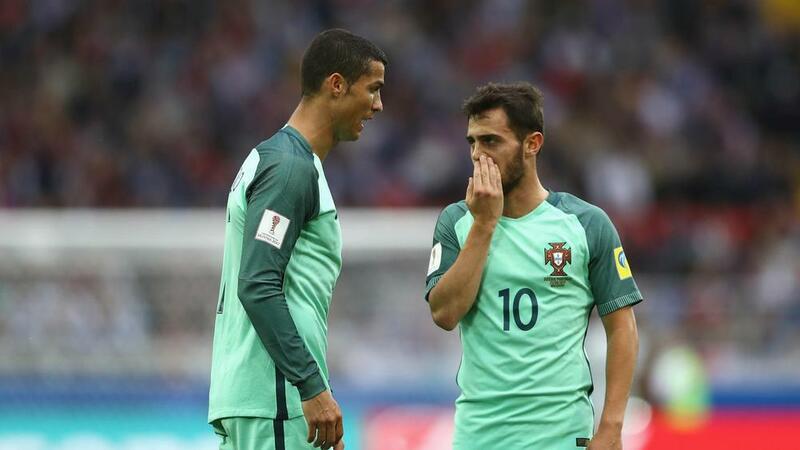 Portugal playmaker Bernardo Silva remains wary of Spain despite a day of high farce that has threatened to end the 2010 world champions' campaign before it has even begun. RFEF president Luis Rubiales made the stunning announcement on Wednesday that he had sacked Julen Lopetegui after the coach negotiated a deal to join Real Madrid at the conclusion of the World Cup without informing the federation. It was also confirmed later in the day that Fernando Hierro would take over for their time in Russia, with their first game coming on Friday against Portugal. With reports suggesting the Spain players - led by Madrid captain Sergio Ramos - were keen for Lopetegui to stay, it hints at unrest in the camp that could put a kybosh on their tilt to regain the trophy they relinquished with a whimper in Brazil four years ago. Silva, though, sees enough quality in the squad to pose a huge threat, irrespective of possible trouble off the field. He said at a news conference: "At a technical level, Spain is the best national team in the world. "That midfield with players from Barcelona and Madrid, obviously they are favourites [on Friday]. The majority of them have won a European Championship or a World Cup, but we have a good team and we will go out to win like we always do. Ronaldo will understandably command much of Spain's – and Ramos' – attention and Silva is impressed at the relentless nature of the five-time Ballon d'Or winner. He added: "Ambition is his strong point. "He's a player that has five Ballons d'Or and five Champions Leagues, who has spent 10 years scoring more than 40 goals a season. "That he's managed to maintain that level gives you an idea of what he represents as a player. "He's our reference point, an example for everyone and we hope that he's in his best form because only if he plays well can Portugal hope to achieve big things." With Hierro parachuted in at such short notice it remains to be seen how he will approach the game against Portugal and, when asked about the style he would like his team to adopt, his answer was vague. He said: "I would like them to play well, to compete well, with quality, to score two or three goals more than the opponent. "On Thursday we travel and we then train in Sochi. There, we have the first match of the World Cup. "On Tuesday, the players trained at a great level and that is what we must do." Who else? Ronaldo's record speaks for itself and the Real Madrid superstar played a pivotal role in Portugal's qualification for Russia 2018. The former Manchester United man was directly involved in more goals than any other player in the European qualifiers, scoring 15 goals and assisting a further three. He will, however, have to try to rectify one lapse on his CV after failing to score against Spain in 340 minutes of action. The man tasked with keeping Cristiano Ronaldo quiet. Reports suggest the pair do not always see eye to eye, so their personal battle represents another fascinating sub-plot. Ramos is also pretty adept at the other end - although most of his goals have come in the white of Madrid. - Portugal and Spain's only previous World Cup encounter was in 2010. Spain won 1-0 in the round of 16 thanks to a David Villa goal. - Portugal and Spain's four encounters at major tournaments (World Cup and Euros) have produced only four goals. - Portugal will attempt to become the fourth nation to win back-to-back European Championship and World Cup tournaments after West Germany (Euro 1972, World Cup 1974), France (World Cup 1998, Euro 2000) and Spain (Euro 2008, World Cup 2010, Euro 2012). - Only England and Spain (three) conceded fewer goals than Portugal (four) in the UEFA qualifiers for the 2018 World Cup. - Spain have finished top of their group in three of their last four World Cups. However, they have won only two of their last 12 opening games in the tournament (D3 L7).